Dr. Nick with a smiling patient one week after her extractions under IV Sedation. Third molars, more commonly called wisdom teeth, are usually the very last of the adult teeth to erupt. In most patients, there is not enough room in the mouth to allow for the third molars to erupt into a normal position. As a result, extensive problems can develop, and removal is indicated. 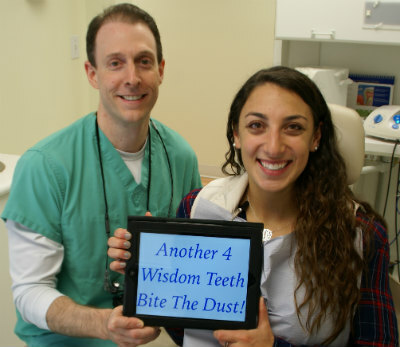 Since arriving in Connecticut in 2009, he has removed tens of thousands of teeth, including thousands of impacted wisdom teeth. He is one of only a select few general dentists in all of Connecticut with a license to administer IV sedation (also called twilight anesthesia) and has sedated hundreds of patients for surgery. He graduated number 1 in his class from dental school and received awards in his rigorous post-doctoral residency program for his expertise and proficiency in oral surgery. Many dentists advertise wisdom tooth extractions but then refer you to an oral surgeon. Dr. Calcaterra’s advanced training enables him to remove nearly all the third molars he encounters, with or without IV sedation. If you come in with wisdom teeth pain, it is highly likely he can handle your emergency in our Orange, CT office. We can nearly always accommodate same day emergencies for patients in pain. 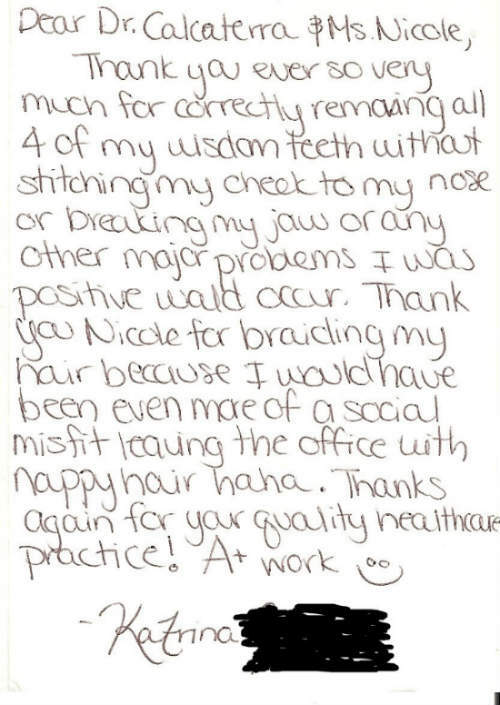 Thank you note from a patient to Dr. Calcaterra. Her last name is blanked out for privacy reasons. Decay on the wisdom teeth or the teeth they are touching (usually your 12 year molars). Inability of the patient to keep the third molars clean, leading to decay and/or gum infections. Acute infection of the gum tissue (called an operculum) overlying the lower third molars which is called pericoronitis. Persistent and chronic cheek biting due to the wisdom teeth being positioned at improper angles. Chronic inflammation of the gum tissue surrounding the wisdom teeth and the second molars leading to a dental abscess. Persistent impaction of food with the third molars leading to odors and/or chronic gum problems. Cysts, tumors, pseudocysts, or other pathologies associated with the wisdom teeth. We’ve removed thousands of wisdom teeth – with and without IV sedation. Watch these two videos of two different patients of ours to learn (and see) about their experiences in our office. If you want to see a video of an actual extraction, with scenes of the surgery itself, you can go here or view it directly on YouTube. This patient developed cavities on his lower teeth adjacent to his wisdom teeth. He needed 6 teeth extracted instead of 4. The red X’s mark the teeth that were removed. Case completed by Dr Nicholas Calcaterra. This patient was told repeatedly about the need to have his wisdom teeth removed. Over time, he developed decay (tooth cavities) on the two lower teeth touching the sideways wisdom teeth. By the time he presented with pain, the two lower non-wisdom teeth were so decayed they could not be saved. So instead of having his 4 wisdom teeth removed, he had to have a total of 6 teeth extracted. Dr. Nicholas Calcaterra completed this surgery using IV sedation. Are you having pain with your wisdom teeth? Do you want IV sedation for your procedure? We do take multiple insurance plans, including Husky (CT State Dental insurance) for patients age 20 and younger. Call us at (203) 799 – 2929 or visit this page to request an appointment.